FYI: Shows coming up featuring Jack at Southern TimberCraft & LogHomesByJack. 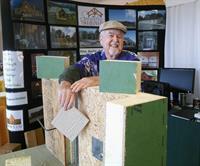 Displaying our eco-panel energy efficient green homes. This Member To Member e-blast is promoted by Smith Mountain Lake Regional Chamber of Commerce.